✨Today We will go over a question that was asked by a few students in The Love School, Help with habits. You'll get info on how to establish a habit, why you don't stick to a habit and tips for time management. ✨And lastly, beginning today I would like to showcase people I know doing awesome things in the world. I want to help spread the word because there may be someone out there that needs or wants whatever they have to share. That's love I want to continue to see in the world. If you have an upcoming event, people let me know. These featured people will be in the PS section of every email. Keep scrolling to see this week's featured people. 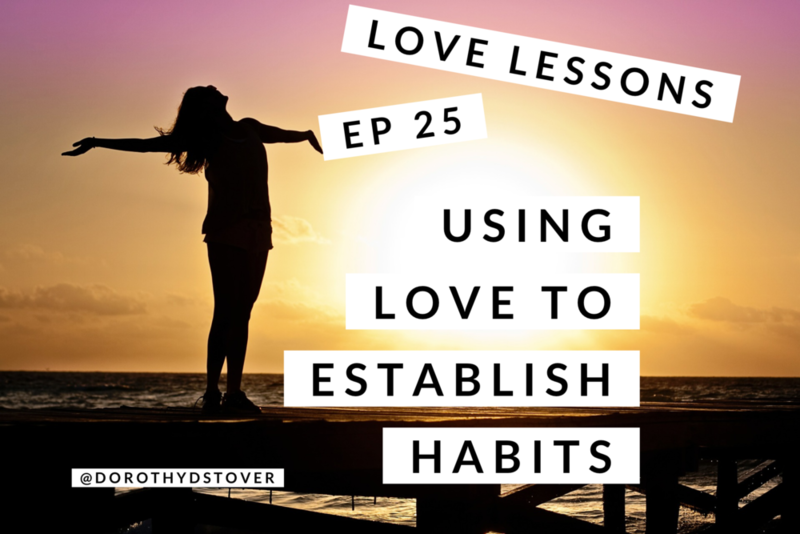 ✨And on to this week's Love Lesson, using love to establish habits. ✨A few of the students over in the love school have asked about helping with habits. I thought I would make a love lesson to help them as well as anyone else that need some tips for making a habit stick. When we talk about habits we are talking about a lifestyle change in a way. We are switching one way of doing something for something else. ✨We can use love for this. Love is the most powerful energy. Nothing is stronger than love. ✨To make a habit stick, we first need to know our priorities. If something is a priority, we will make the time for it. We will figure out how to make it work. The priority that most people are challenges with is making ourselves a priority. We were taught that's self indulgent or selfish. It's not. All those benefit when we care for ourselves. ✨Why a habit doesn't stick? You either don't love it or it's not a priority. If you don't love be it, find something you love. If it's not a priority, ask yourself why. Something to think about, while you are establishing a habit, something else may be put on the back burner. Once the habit is in place, bring whatever you had to put to the side back in the mix. Look at your priorities and make some decisions. Some of those decisions may be tough. ✨Loving something is the easiest way to make a change in your life. For example, if you're trying to workout more, then find a workout activity that you enjoy. There's so many ways to be active! And there's something for everyone. I sometimes play on a playground. I work my whole body this way and have fun. ✨I set my tomorrow up tonight. Pick 3-5 things you are able to do tonight that will make your day easier tomorrow. For me, it's laying out my clothes, knowing my workout in the morning and knowing my priorities. ✨Next, what are 3-5 things you can do in the am to set yourself up for the day. Mine is make my bed, some form of activity like a workout or yoga and put in a load of laundry. ✨Sara Boyce retreat. Costa Rica, adventure and health...yes please! 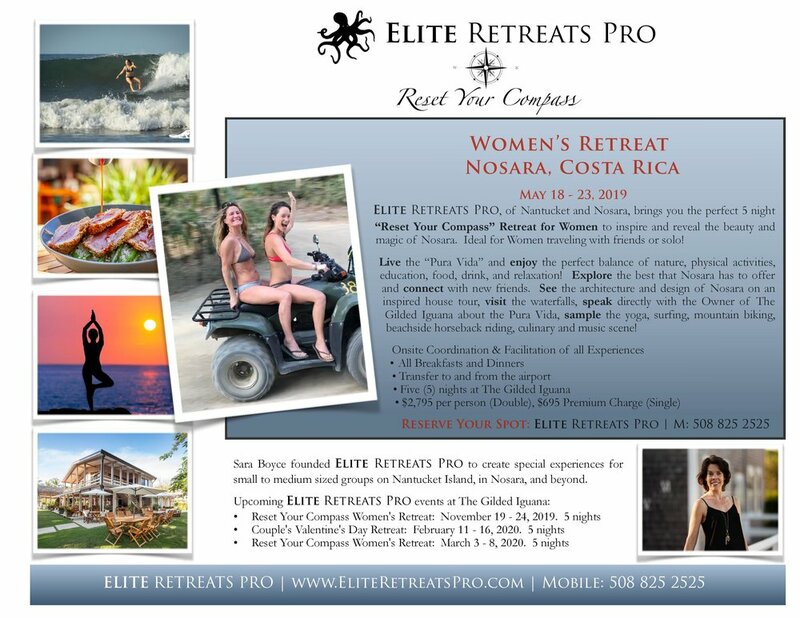 Elite Retreats Pro is expanding beyond Nantucket to Nosara and we are offering a series of fabulous Retreats. The first Reset Your Compass Women’s Retreat is May 18 - 23, and the next are in November and March (2020). We also have a Couples Valentine’s Day Retreat planned, which will be fun! Elite Retreats will be hosted at The Gilded Iguana, right in the heart of Nosara. It is going to be amazing - and Nosara is an exceptional town. The beach is beyond compare - and the steady surf is terrific for experienced surfers and beginners! ✨Suzanna Kaye. Free 5 day Paper challenge.